To date, 15 undergraduates have participated in the program, which provides independent research opportunities, as well as summer housing, faculty mentors, full-time work during the summer, and part-time work during four academic quarters. Students work closely with faculty mentors on research projects in topics related to agroecology and food systems, including sustainable agriculture, ecosystem services, and food justice. 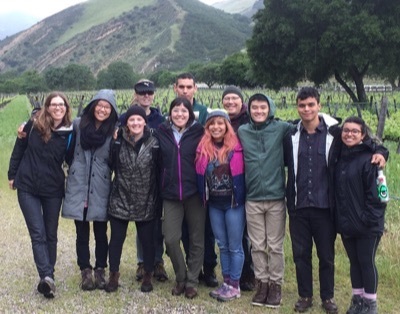 Students in the program, which emphasizes interdisciplinary solutions, have investigated topics that range from plant physiology to food justice. "This program gives students professional development and research skills at the same time," said Stacy Philpott, professor of Environmental Studies and the coordinator of the program, known as Supporting Undergraduates by Promoting Education, Research, Diversity, and Agricultural Resilience (SUPERDAR). "We learned from the first cohort that it also provides underrepresented students with a greater sense of belonging on campus, which is another welcome benefit of the program." The program begins in the spring when participating students, known as fellows, meet their faculty mentor, develop their research proposal, and prepare for full-time research over the summer. Fellows receive stipends for eight hours per week during the school year, and 40 hours per week for eight weeks over the summer. Free on-campus summer housing is also provided as part of the program. For Emily Miethke, who transferred to UC Santa Cruz from MiraCosta College in San Diego County, the SUPERDAR program offers just the kind of hands-on research experience she was hoping to get at a public research university. Summer housing and paid work experience were essential to her ability to participate. "I wanted a job, and I wanted to see what I could do, so I applied," said Miethke, who is working on a soil-pathogen project with Environmental Studies Professor Carol Shennan and research scientist Joji Muramoto. Shennan and Muramoto pioneered a novel strategy called anaerobic soil disinfestation (ASD) to fight soil pathogens that can devastate strawberry fields. Many farmers have welcomed this alternative to fungicides, but the cost of rice bran—a key ingredient—is soaring, prompting Shennan to look for alternatives. Which is where Miethke comes into the story. Miethke has run two experiments with 85 plants to test the effectiveness of six alternatives to rice bran. Replication is important in agricultural research, because there are so many variables. "The first round was attacked by birds that poked holes in the plastic, and we got a lot of salt damage," she said. "We weren't seeing the effects of the disease, just a lot of stressed out plants." Now, with the second round, the plants are healthier, allowing Miethke to track the prevalence of disease and compare the impacts of the different alternatives to rice bran. "That's what research is: seeing what doesn't work, moving on, and learning from it," she said. Miethke, a full-time student who works in Shennan's soils lab on campus in addition to the SUPERDAR fellowship, looks forward to the possibility of publishing her results as part of a paper with Shennan and Muramoto. An environmental studies major with an agroecology focus, she has learned a lot about the impact of agriculture on the environment, which made the ASD project a good fit. "I'm interested in alternatives to monoculture farming and helping to find biological alternatives to the pesticide- and fungicide-ridden systems we have now," she said. "It's been a huge growing experience for me," she said of the fellowship. "I've learned so much. I've gained professional skills, and I'm not afraid to ask questions, to reach out to established scientists, to speak up when I don't understand. I've found ways to fend for myself and be confident." For senior Michelle Hernandez, who is majoring in cognitive science, the SUPERDAR program gave her a chance to focus on food justice. She and another SUPERDAR fellow are exploring the function and value of a community garden located at Calabasas Elementary School in Watsonville. By exploring parents' relationship to the garden, Hernandez is hoping to illuminate long-term strategies to give them an opportunity to grow their own healthy food. "This research is based on ethnographic observation, being present, and building community," said Hernandez. Once she gets to know parents, most of whom are farmworkers, she conducts open-ended interviews, often in Spanish, then transcribes and translates the conversations. She is in the process of coding and analyzing the results. "It's beautiful, because there's a big stigma to working in the fields, but the garden is different," she said. "I hear how they connect with the land and are enjoying what they do. They tell me, 'Working is one thing, but growing my own food is different.' 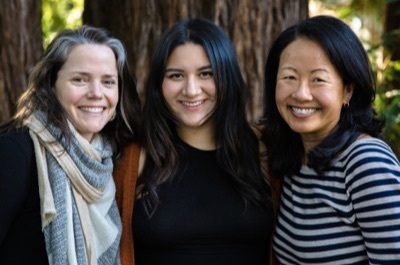 "
SUPERDAR gave Hernandez her first opportunity to work closely with a faculty member, and she feels lucky to have the mentorship of Environmental Studies Professor Flora Lu, who is provost of Colleges Nine and Ten, as well as Linnea Beckett, who coordinates the Food Justice Program for Colleges Nine and Ten. "They are both amazing women," said Hernandez. "They have really taught me about who I am and how the world works." Hernandez is "doing graduate work as an undergraduate," said Beckett. "She is reading the literature on school and community gardens, Latino parent engagement, settler colonialism, and land education," she said. "It's a really intersectional project." "Michelle is an incredible representative of UCSC to the farmworker families," added Lu. "She demonstrates genuine concern, compassion, and connection with the families. Through her study of decolonization, feminist critical theory, race, and class, she has acquired the language to describe the challenges they face, as well as her own experience as a Latina, first-generation, student of color." Hernandez is helping organize "Dig In: Cultivating Inclusive Approaches to Food Justice," a daylong conference sponsored by Colleges Nine and Ten in collaboration with many campus and community partners. She will make a presentation about her work during the event. "Research takes a long time," she said. "You can't do it in a few months. It's the only way you can feel involved. I like it. I really like it." And she feels like she belongs. "I wish I had been part of this project during my first year," she said. "It's so fulfilling." SUPERDAR is part of the USDA's Experiential Learning Initiative Program, which provided about $275,000 for the three-year program. Student interest is strong, and seven faculty mentors have participated to date, their expertise spanning subjects that include plant physiology, climate change, biodiversity, pest control, soils, and food security. Many students conduct research on campus, either at the Alan Chadwick Garden or the UC Santa Cruz Farm. "It's a wonderful program that gives students a chance to take a deep dive," said Philpott. "It's extraordinary for an undergraduate to spend 15 months on research. There are very few programs like this, especially in the field of agroecology." The program opens up job opportunities for graduates and gives students a leg up when they apply to graduate school, because it shows their ability to carry out an extended, in-depth research project, which is attractive to prospective graduate mentors, added Philpott. Because Philpott has been a frugal administrator, the program will continue this summer with five more fellows. "We're stretching the funding to give more students the opportunity," she said.